Stampin Up Demonstrator - Lynne Fahey (Spiralz and Curlz): Last few days of Sale-a-bration 2016... don't miss out! Last few days of Sale-a-bration 2016... don't miss out! 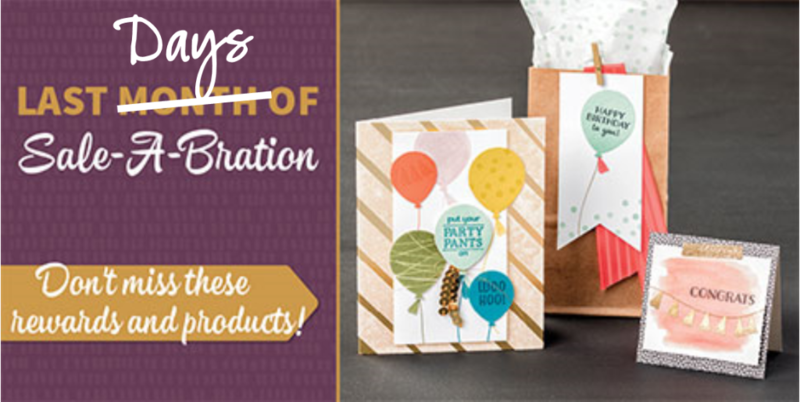 It's the last few days of this years Sale-a-bration promotion.... so don't miss out! Choose £160 worth of any catalogue products and pay just £99 including post and packing. You will also get a discount of at least 20% on anything else you order until at least July, which means discount in the NEW Annual catalogue coming out in the next few months too! How awesome is that?? You are not obliged to do anything more, but if you want to get your hobby to pay for itself or bring some extra money in you can do that too. Not only that, but you will also be joining an amzing group of people who all love crafting and get invited to our exclusive Stampin' Up! events. We are so looking forward to welcoming you! Click here to order your STARTER KIT today or contact me for more information (07828 149 666 or lynne.fahey@gmail.com) but don't leave it too late or you'll kick yourself! For every £45 you spend in the main Annual Catalogue or Spring/Summer Catalogue (the one with the balloons on the front) you can choose FREE product! but only until the 31st March, then it's too late. So why not make that wish list now, top up on your cardstock, inks, pens etc and if it comes to more than £100 then you'd be silly not to buy the starter kit and get £160 worth of amazing Stampin' Up! quality goods. Have fun shopping and don't miss out! !